May 1st, 2011 was a blessed day in every way. It was the beginning of May, the month dedicated to Mother Mary. It was the Feast of St. Joseph the worker. It was Divine Mercy Sunday. And it was the day Pope John Paul II was beatified. For those of you who missed watching the Beatification of Pope John Paul II, you can still watch it on the Vatican website. Click on Agenda and select May 1st from the Calendar. “I leave you now with this prayer: that the Lord Jesus will reveal Himself to each one of you, that He will give you the strength to go out and profess that you are Christian, that He will show you that He alone can fill your hearts. Accept His freedom and embrace His truth, and be messengers of the certainty that you have been truly liberated through the death and resurrection of the Lord Jesus. This will be the new experience, the powerful experience, that will generate, through you, a more just society and a better world. 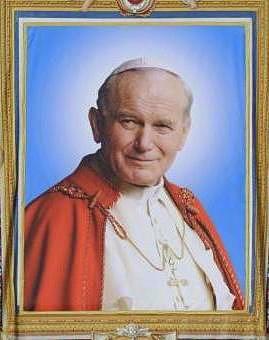 God bless you and may the joy of Jesus be always with you!” – Address of His Holiness John Paul II to the Students of the Catholic University, Washington, Sunday, 7th October, 1979. Oh Blessed Trinity, We thank you for having graced the Church with Pope John Paul II and for allowing the tenderness of your Fatherly care, the glory of the cross of Christ, and the splendor of the Holy Spirit, to shine through him. Trusting fully in your infinite mercy and the maternal intercession of Mary, he has given us a living image of Jesus the Good Shepherd, and has shown us that holiness is the necessary measure of ordinary Christian life and is the way of achieving eternal communion with you. Grant us by his intercession, and according to your will, the graces we implore, hoping that he will soon be numbered among your saints. Amen.